Va. Lt. Gov. Fairfax Asks For FBI Investigation After 2nd Sexual Assault Accusation Virginia Lt. Gov. Fairfax requested on Saturday that "no one rush to judgment" after a second woman came forward to accuse him of sexual assault. Virginia Democrats are calling for him to resign. "Mr. Fairfax's attack was premeditated and aggressive," her lawyers said. "The two were friends but never dated or had any romantic relationship." Watson has requested that Fairfax resign. Through her lawyers, she said that she was "reluctantly coming forward out of a strong sense of civic duty." Fairfax denied the allegation and said in a statement Friday: "I will not resign." "I deny this latest unsubstantiated allegation. It is demonstrably false. I have never forced myself on anyone ever," Fairfax said. "I demand a full investigation into these unsubstantiated and false allegations. Such an investigation will confirm my account because I am telling the truth." Fairfax vowed to clear his "good name" and noted he has passed FBI background checks and run for office "with nothing like this being raised before." Watson is the second woman to come forward with sexual assault allegations against Fairfax in a week. Just days ago, Scripps College professor Vanessa Tyson released her own detailed account of an alleged assault by Fairfax in a Boston hotel room during the 2004 Democratic National Convention — a claim Fairfax also denies. 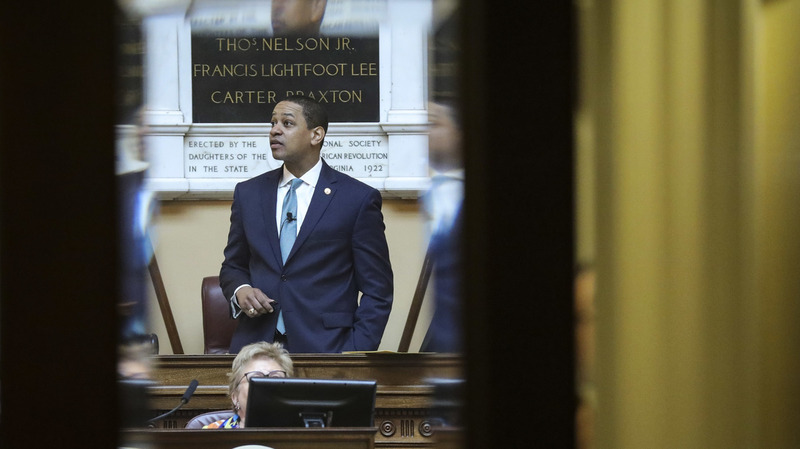 "Due to the serious nature of these allegations, we believe Lieutenant Governor Fairfax can no longer fulfill his duties to the Commonwealth," Democrats in both chambers said in a statement Friday night. "He needs to address this as a private citizen. The time has come for him to step down." "The allegations against Justin Fairfax are serious and credible. It is clear to me that he can no longer effectively serve the people of Virginia as Lieutenant Governor," former Virginia Gov. Terry McAuliffe tweeted Friday after Watson's allegation surfaced. "I call for his immediate resignation." That call was echoed by nearly every member of Virginia's national congressional delegation, including Rep. Jennifer Wexton. The latter, a Democratic freshman who won election to national office in 2018, asserted earlier this week that she believed Tyson. On Friday, she took that statement a step further. "I believe Dr. Vanessa Tyson. I believe Meredith Watson," she tweeted. "And I believe Lieutenant Governor Justin Fairfax must resign." "The Lieutenant Governor of Virginia presides over the Virginia Senate and must be prepared to fill the role of Governor," they said. "It is unacceptable that either of these weighty responsibilities be entrusted to someone who has engaged in the behavior described by Dr. Tyson and Meredith Watson, particularly in light of Gov. Northam's situation, which we continue to believe requires his resignation." "This is the second serious sexual assault allegation leveled against the Lieutenant Governor in the past week," Wilson said. "As with Dr. Tyson's allegation, it needs to be investigated thoroughly because it impacts his ability to continue to serve the Commonwealth." NPR's Sarah McCammon and Emma Bowman contributed to this report.